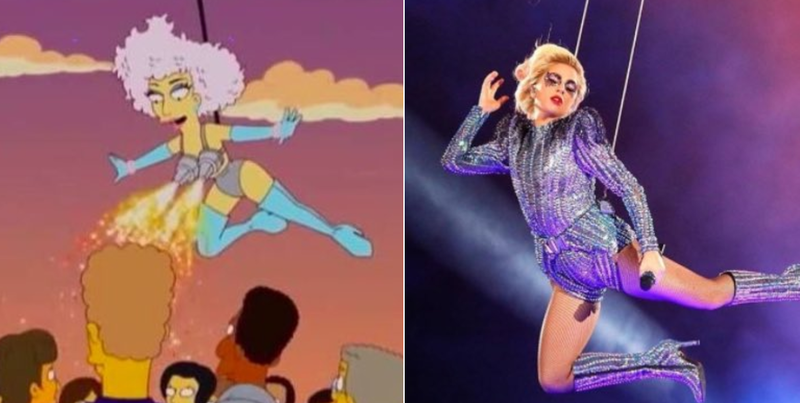 Home Entertainment The Simpsons Eerily Predicted Lady Gaga’s Super Bowl Performance FIVE Years Ago! Did you ever see that Simpsons episode where they basically predicted that Donald Trump would one day become US President? It was pretty crazy. But it wasn’t the only time that Matt Groening and his team of writers have struck pay dirt when it comes to psychic predictions. And they’ve done it again! Lady Gaga’s recent performance at Super Bowl LI stunned pretty much everyone who watched it. Her medley of songs, along with some crazy technical effects and wizardry made it into one of the most memorable Super Bowl halftime shows ever. But it was eerily all predicted a full five years ago in a Simpsons episode. Right down to her ‘flying’, her costume and a few more details… Strange, huh?! Previous articleMariah Carey Hits The Gym Rocking Heels And Diamonds! Next articleThe Fate of the Furious Super Bowl Commercial Reveals Plot Points; Looks AWESOME!